When I walked out of “Melancholia” last night, I really needed a hug, a reassurance that not only was Earth safe in the Universe, but that humanity was decent, kind, and deserving of life. Aki Kaurismaki’s “Le Havre” is the hug I needed personified through film. It is a joyous movie that has not the room nor tolerance for evil or darkness: good things happen to those who do good, people are warm and compassionate towards one another, and hard work pays off in spades. “Le Havre” isn’t just heartwarming, but life affirming; I left the theatre not needing a hug, but compelled to give others hugs. As I discussed yesterday, our most basic instinct for judging film is emotional reaction, and based on the wide smile I wore from start to finish, “Le Havre” is a rousing success. It tells the story of Marcel Marx, a sixty-something shoeshine in the French port city Le Havre. Marcel’s life is simple: he scrounges up what little money he can shining shoes, brings it home to his loving wife, and should there be anything left after buying groceries, he walks down the street to the local bar and enjoys a drink in the company of friends. One day, while Marcel’s wife is hospitalized with a serious illness, he comes across a young illegal immigrant from Africa named Idrissa. Though the authorities are hot on Idrissa’s trail, Marcel decides to help the boy, taking him home and sheltering him until Marcel can find a way to get Idrissa back to his mother in London. As those around Marcel witness his good deeds, they all become friendlier than ever and help Marcel in his quest; together, this community may just succeed in doing the impossible. And what a community this is. The primary strength of “Le Havre” lies in its rich, deep cast of characters, all of whom arrive fully formed and only become more endearing as the film moves along. There’s Yvette (Evelyne Didi), the caring bartender always ready with words of wisdom; Claire (Elina Salo), the proprietor of a bakery across the street, who helps take care of Idrissa and supplies Marcel with hilariously long loaves of bread; Marcel’s wife Arletty (Kati Outinen), so plainspoken but so genuine and lovable; Chang (Quoc Dung Nguyen), Marcel’s effortlessly cool assistant who, thanks to his similar love of life and helpful nature, is essentially Marcel-in-training; and I simply can’t get over how much I loved Inspector Monet, played so wonderfully by Jean-Pierre Darroussin. Though we know little about the man, his sense of morality and general demeanor is so charming that I would love to spend an afternoon chatting with the character. As wonderful as the supporting players may be, none of them come close to matching the perfection of Marcel Marx. Marcel may very well be my favorite screen character of 2011, a delightful but down-to-earth man who is good to his core. It’s often hard to center a film around such a virtuous character, especially when the narrative in no way revolves around testing his pure nature, but Andre Wilms is splendid in the part, successfully selling Marcel’s motivations and kindness at every turn. I loved the character so much that, more than any other film in 2011, I would like to see a sequel to “Le Havre,” and a third film, and so on and so forth, just so Marcel can come back and have many more adventures in the future. These characters are all so finely crafted, the community they share so perfectly realized, that watching “Le Havre” is akin to taking a vacation and being welcomed warmly by a group of friendly locals. Writer/Director Aki Kaurismaki knows exactly what to do with his cast, creating a number of obstacles for Marcel and company to overcome while never resorting to contrivance. There’s a wonderful sense of free-wheeling fun to the proceedings; when Marcel needs 3000 euros to smuggle Idrissa to Africa, for instance, he and Yvette have the idea to hold a charity concert with a local former rock-star, Little Bob (who is a real musical celebrity in the city of Le Havre). It’s a silly idea, but wonderfully so, and because Marcel has the kind of attitude that makes anything possible, it works brilliantly. Though “Le Havre” is primarily a piece of light entertainment, there is actually a deeper level to the story in the way is casually but meaningfully discusses illegal immigration. In North America, Mexican and American films based around our own immigration struggles are so often too emotionally invested in the material, too obsessed with grand gesture to actually say anything substantive. 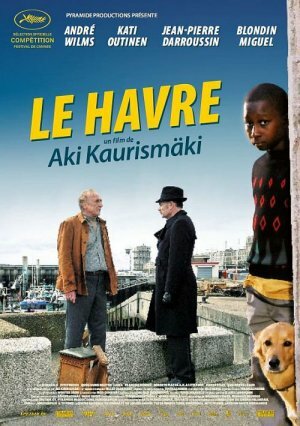 In “Le Havre,” Kaurismaki takes a step back and approaches the subject as simply as possible. 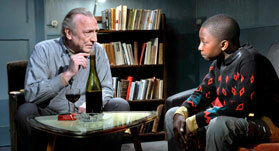 Idrissa is a young boy, and therefore, none of the characters in the film have a moment’s hesitation in deciding to help him. He is a child who has fled from a dangerous existence and needs to find his mother, and that’s all Marcel and friends need to know to lend a hand. To me, that kind of simple, unquestionable humanity says so much more about the nature of illegal immigration and how we as people should approach it than more overtly political films ever have. As a character, Idrissa is under-developed (though Blondin Miguel plays the role quite effectively), but the themes surrounding him are strong enough to ignore this one failure. Visually, “Le Havre” is absolutely spectacular, one of the best-looking films of the year. Timo Salminen’s cinematography is exquisite, full of warm, rich colors and lavishly detailed frames. In most films, the 1.85:1 aspect ratio quite often doesn’t look as cinematic as it should, but Kaurismaka and Salminen apparently didn’t get that memo; they stretch the boundaries of what narrower framing can accomplish, and in so doing, make this relatively quaint film look marvelous on the big screen. Like “Melancholia,” this is a movie you’ll want to experience theatrically; it just won’t be as lush on home video. But however you see it, there is a richness to “Le Havre” that cannot be ignored. The characters and community they create is splendid, the message is subtle but meaningful, and Marcel’s journey is oodles of fun at every turn. “Le Havre” is a testament to the power of pure, unabashedly jubilant entertainment, and I can’t imagine a single person not being charmed by the experience. 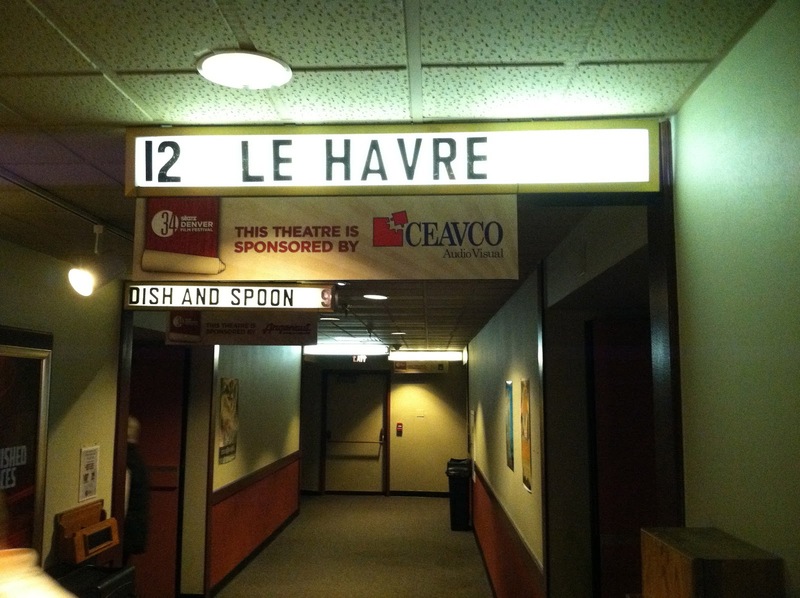 “Le Havre” will be playing at a Denver area Landmark Theatre (which one has not yet been announced) beginning December 2nd for one week. Parking at the Festival is expensive! Please contribute to the site to support the transportation that makes these festival reviews possible!